Asus is one of the best wireless router manufacturer in the market thanks to the class leading AsusWRT firmware. 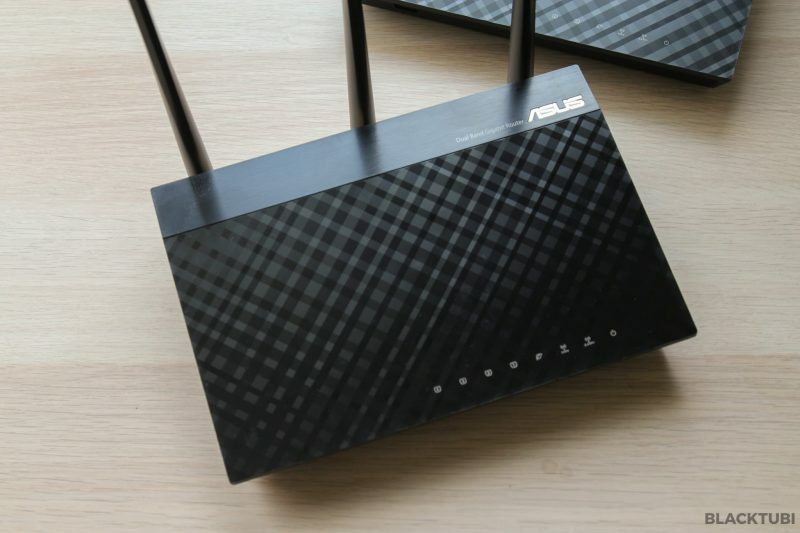 Asus introduced the AiMesh system to improve WiFi speed and coverage. 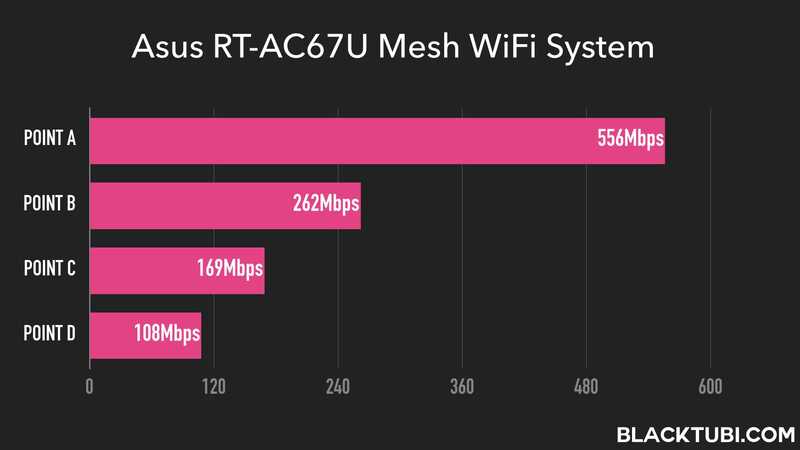 The Asus RT-AC67U mesh WiFi system is recently released and it is powered by AiMesh. Mesh WiFi is the future of WiFi connectivity. With Mesh WiFi, we can have faster WiFi connection and a bigger WiFi coverage. This is achieved by having multiple mesh nodes working together to deliver a faster WiFi connection. Besides, mesh WiFi systems are better integrated to improve the entire user experience unlike WiFi repeaters. 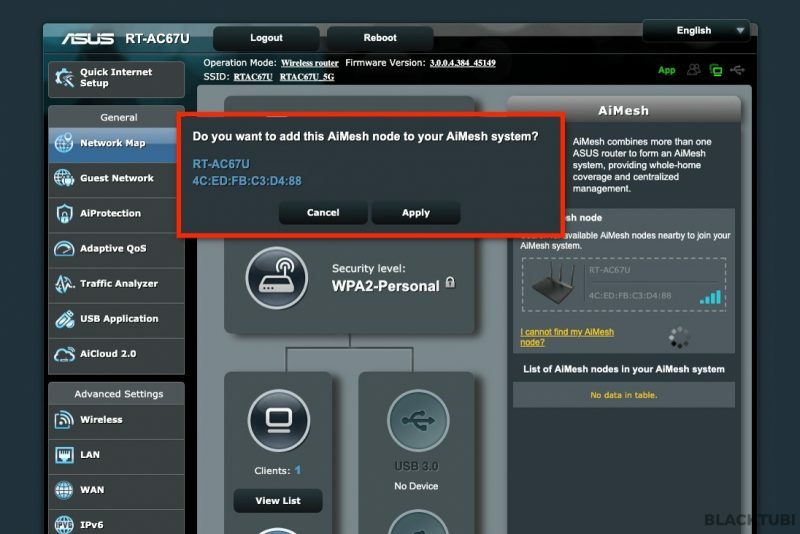 AiMesh Mesh WiFi system works by have a router as the the parent unit and connected to the ISP modem. This parent unit will be the router managing the mesh network. Next, up to 10 routers can be added as AiMesh nodes. All the devices will then talk to each other wirelessly to expand your WiFi coverage. Although it sounds similar to WiFi repeaters, the actual outcome is much better. This is due to all routers in the network are actually integrated. They are all in the same network and you will get the same IP address. Besides, AiMesh comes with features such as band steering and roaming to make entire WiFi experience even better. The best part of AiMesh is it works on high power fully fledged Asus router so rather than mesh systems which normally comes with less features and lesser LAN ports. The RT-AC67U for example comes with 4 LAN ports and 2 USB ports. 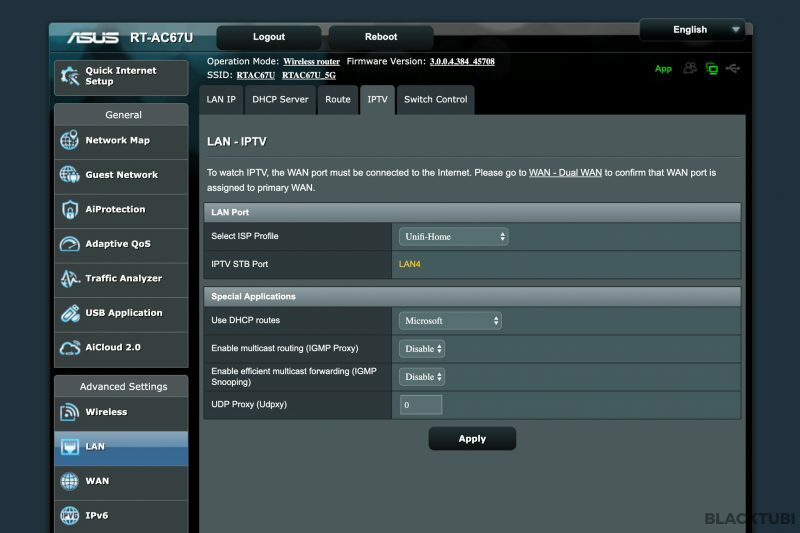 Besides, you get to enjoy the full feature set of ASUSWRT. Not to mention that it is also possible to reuse an older Asus router as an AiMesh node to expand the coverage. As such, it is possible to use the RT-AC67U with the ROG Rapture GT-AX11000 as well. 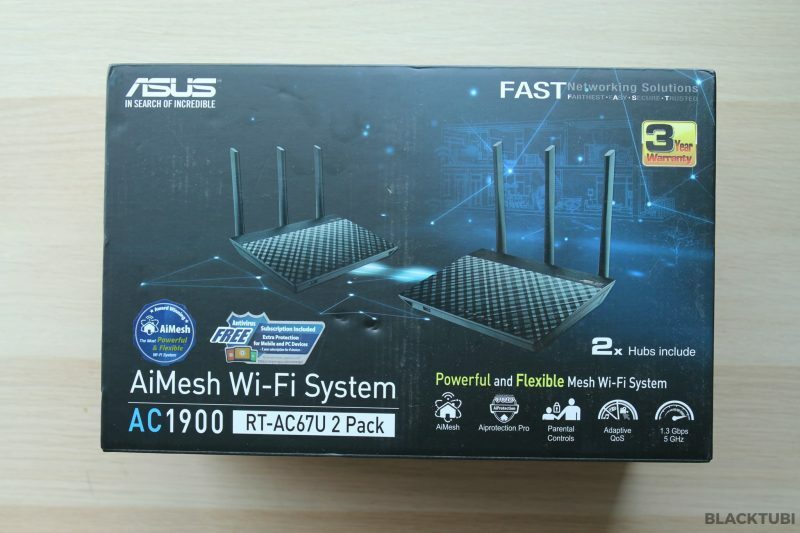 Asus RT-AC67U AiMesh pack comes with 2 device in the pack and both router have the exact same hardware. 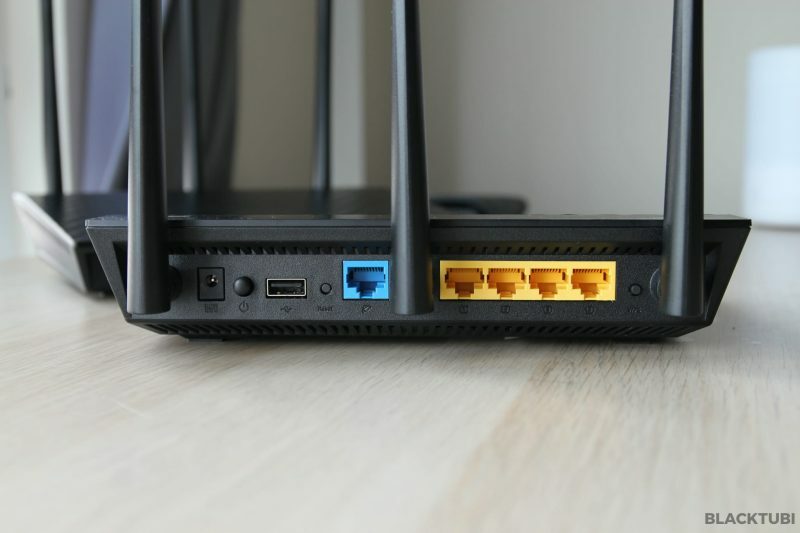 The design is like normal routers unless most mesh WiFi system without external antennas. 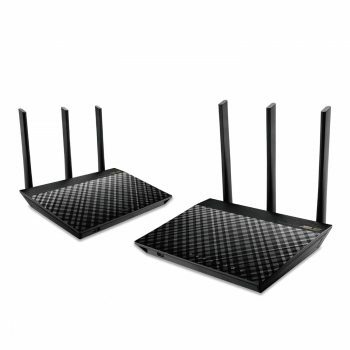 The router support Wireless AC up to AC1900 in a 3×3 dual band configuration. This mean maximum link speed up to 1300Mbps on 5Ghz and 600Mbps on 2.4Ghz. ASUS RT-AC67U also comes with plenty of ports. Each router features 4 Gigabit Ethernet port and 2 USB ports with one of them being USB 3.0 capable. You can use the USB port to share files, printer and even use it for your private cloud storage with ASUS AiCloud. They also come with 3 non-removable external antennas, something many mesh WiFi system do not have. 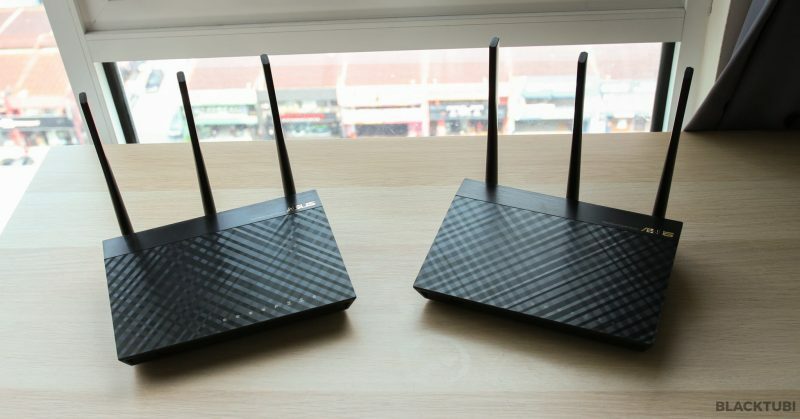 ASUS AiMesh setup process is slightly longer compared to the normal ASUS routers. 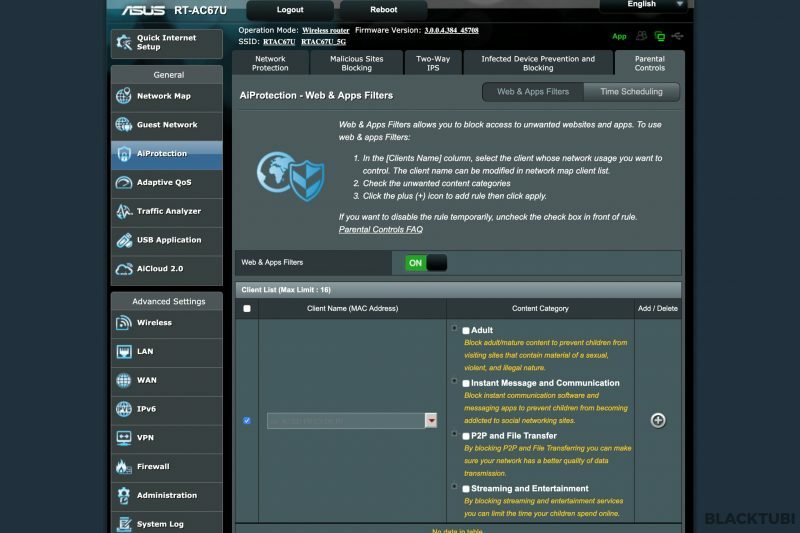 We prefer to setup ASUS AiMesh system using the web interface as it is easier. The first unit of the RT-AC67U is connected to our ISP modem then we followed the setup wizard like any ASUS Router. ASUS RT-AC67U AiMesh system is fully compatible with Unifi with HyppTV working. 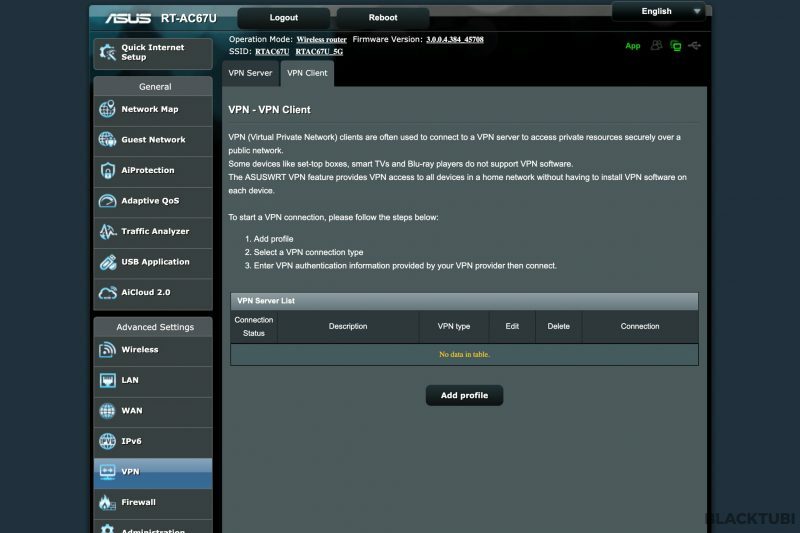 You can refer to my ASUS router Unifi setup guide here. Once that is done, we turn on the second unit then we navigate to the web interface of the main router. We clicked the search button to search for AiMesh node. Once the second unit is found, we add it to form a Mesh WiFi network. The second router will then reboot and this entire process took us 15 minutes. 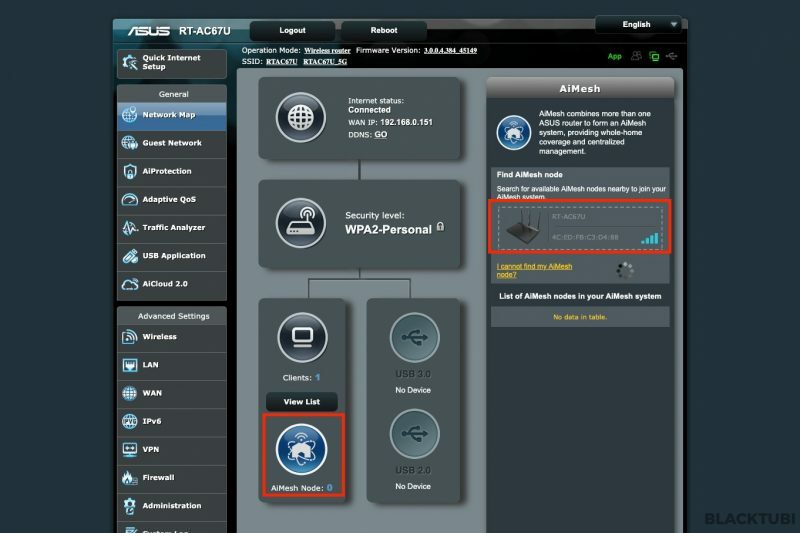 If the second router is successfully added, the router will appear in the AiMesh section. 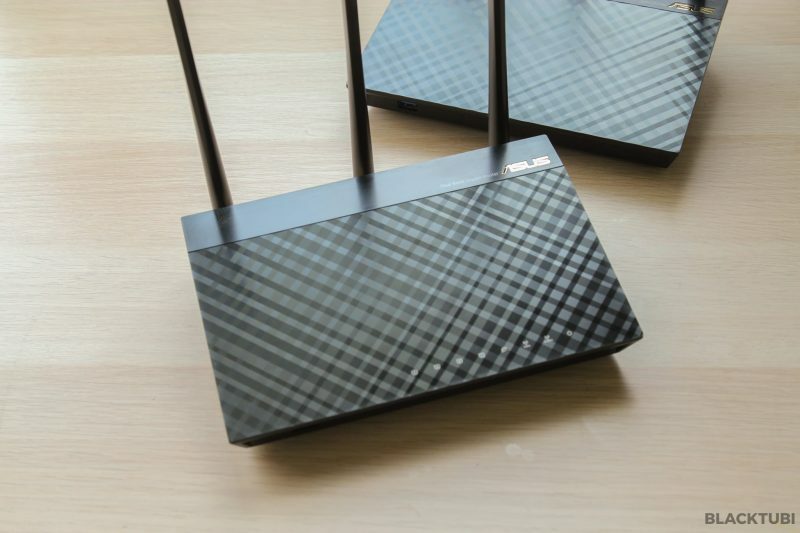 With the mesh system configured, the mesh node will have the exact same WiFi name and password as the main router. It can then be placed anywhere in your home then they will work together to improve the WiFi coverage and speed. 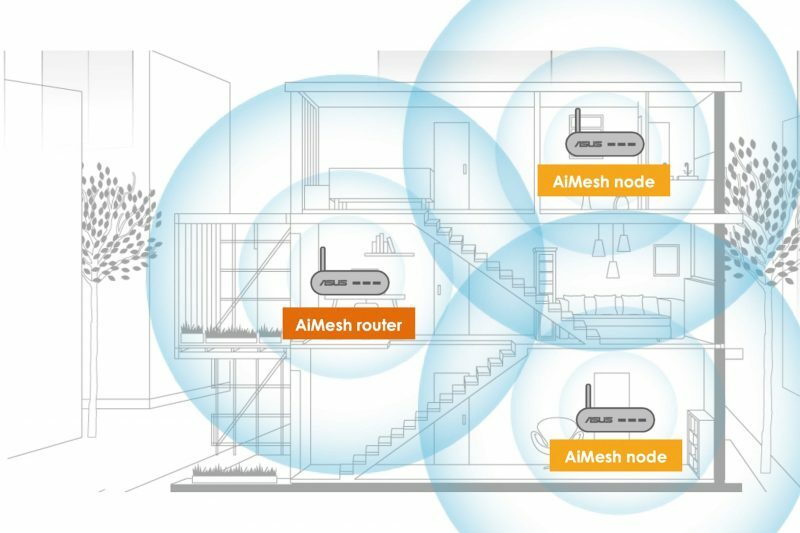 AiMesh can also work with Ethernet backhaul. Image not drawn to scale and attached bathroom not drawn. Our key focus on the RT-AC67U will be the mesh performance and see how well it performs. Being a dual-band AC1900 router, the maximum link speed on 5Ghz is up to 1300Mbps. We will be conducting a WiFi speed test on our iPhone via Ookla’s Speedtest app around our apartment. The performance of the RT-AC67U is really impressive. Previously, the WiFi speed at point D is barely usable due to multiple walls in between and the use of metal door in my apartment. 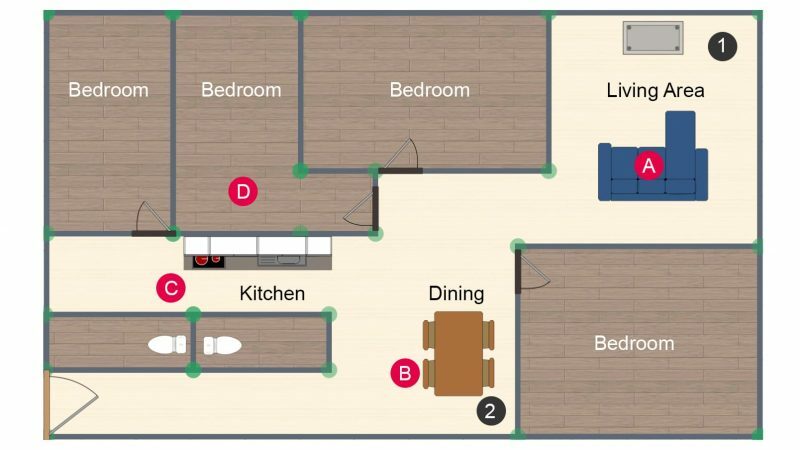 By having the RT-AC67U mesh WiFi system, it effectively improve the WiFi speed and coverage in my entire apartment. The AiMesh node will help due to my rectangular shape layout. There is only so much a WiFi router can transmit due to regulation. Our setup uses the same name for both the 5Ghz and 2.4Ghz channel. We allow our device to select which band is most suitable. 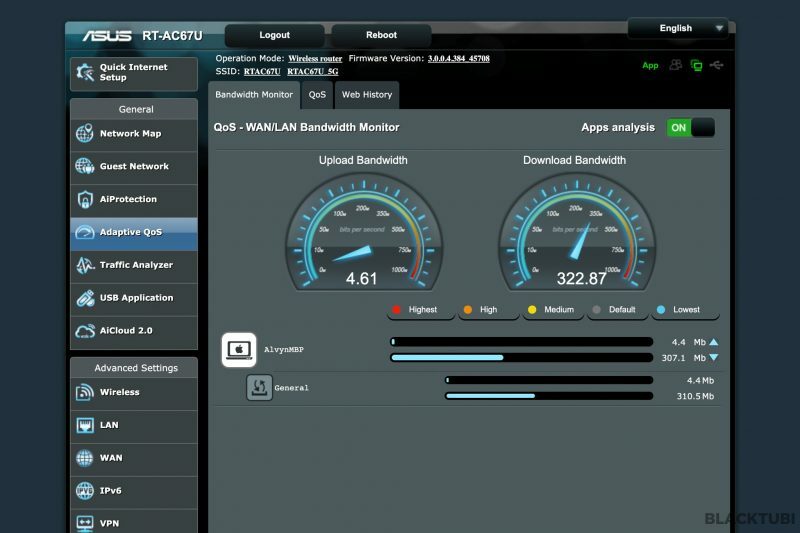 ASUSWRT is without a doubt the best router firmware in the market with plenty of features and good stability. 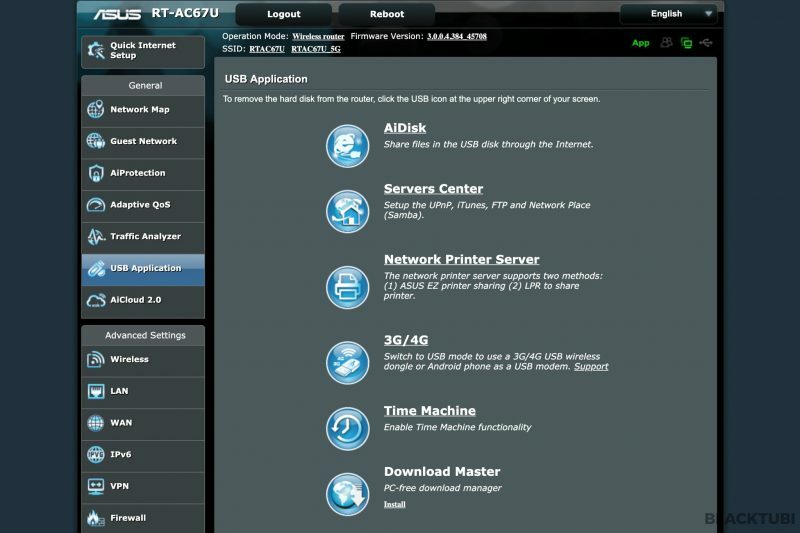 The RT-AC67U user interface is easy to use and simple to setup. 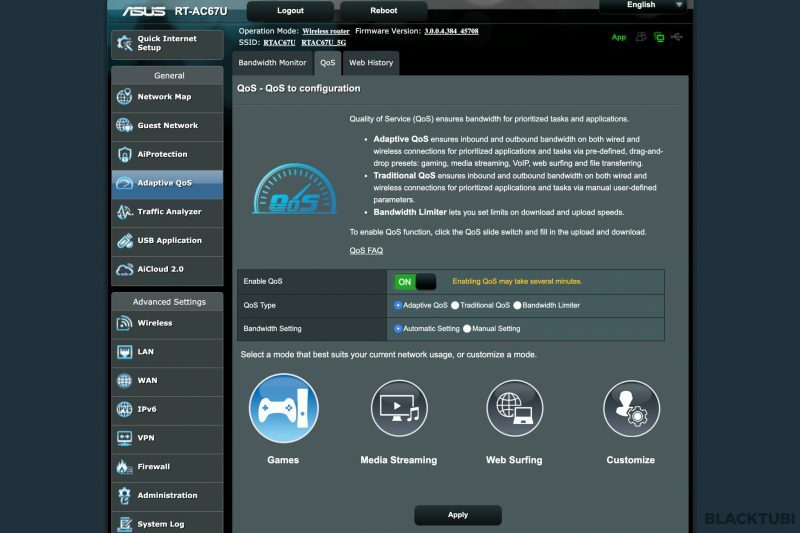 ASUSWRT itself can be a really good reason to get Asus AiMesh system. RT-AC67U comes with so much features that it is impossible to say every single one of them. We selected a few where we want to focus below. Asus RT-AC67U also features the ASUS Router app. The app is pretty powerful as it very effective in monitoring the connection. You can see the health of each AiMesh node and see what devices is connected to which node. 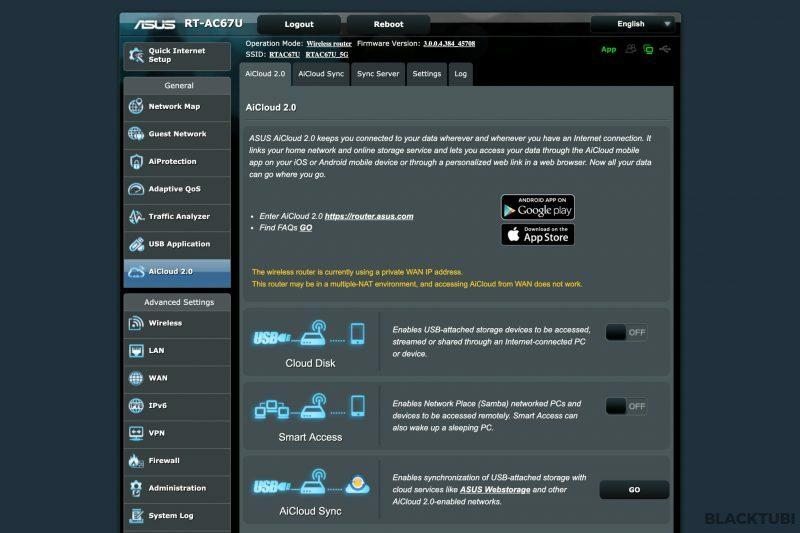 All the QoS and parental control options can be managed on the app as well. 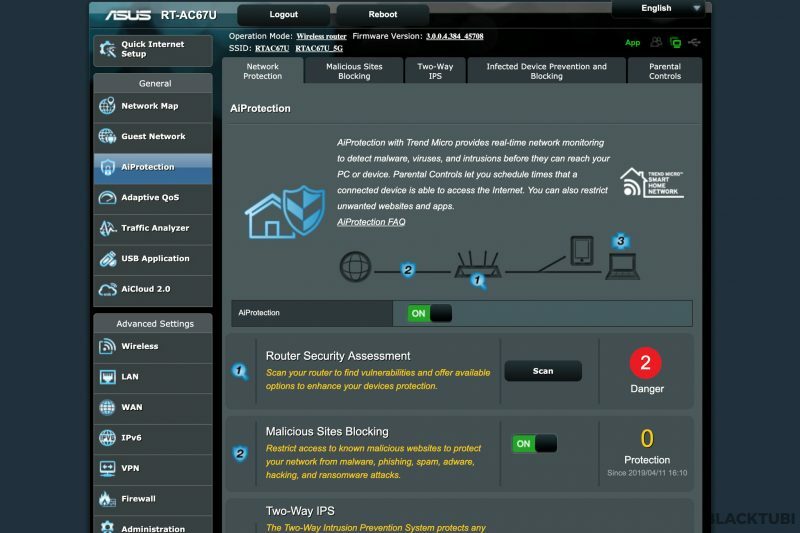 The RT-AC67U is not all about WiFi, it included a built-in AiProtection Antivirus solution to protect all your devices connected to the network. AiProtection is powered by TrendMicro so the database is pretty reliable. We tested it with some malware infected website and it is successfully blocked by the router. AiProtection is not purely an Antivirus solution. It also comes with a rather comprehensive parental control to protect your loved ones. The parental control can have a really granular content limitation base on category and the ability to configure time limits. ASUS AdaptiveQoS is also the most robust QoS solution in the market. Not only it is the most effective application based QoS, it also offers a ton of visibility. With app analysis turned on, you can see what sort of contents the devices are using. 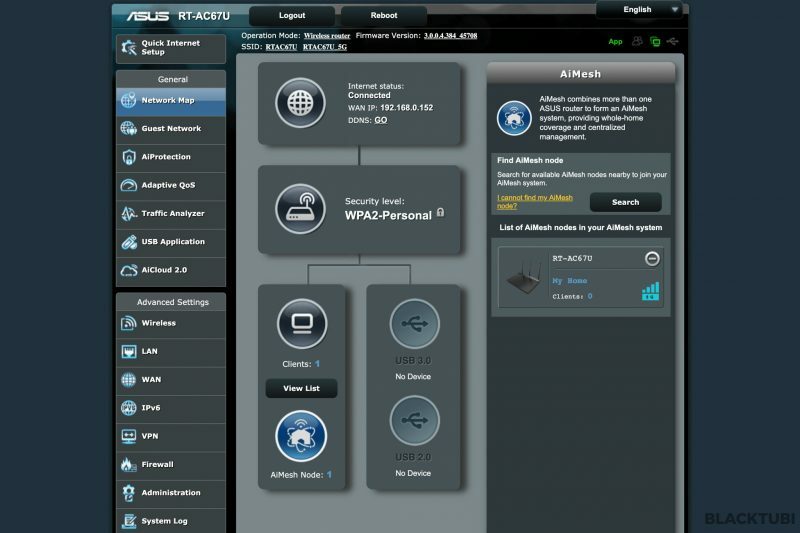 Besides, Asus also included the Traffic Analyzer which is a log on how much traffic and categorize them. There is also a Web History feature as well. All of these can be turned off if you prefer privacy. ASUS AiMesh is a great system, it offers a lot of flexibility. The RT-AC67U we tested is a great mesh WiFi system with good performance. AiMesh differentiates itself from the competitors by offering a lot of features and a lot more hardware. You get a more complete package as the RT-AC67U is a fully fledged router with 4 LAN ports and a firmware that comes with plenty of features. However, like everything, the RT-AC67U is not perfect. It lacks the 802.11k/v/r fast roaming standard. But, Asus included their own roaming mechanism and it does seem to work pretty well. We would prefer if it comes with the standardized fast roaming instead. Asus RT-AC67U is a feature packed AiMesh mesh WiFi system with great mesh WiFi performance and excellent hardware.